This isn't out of the realm of possibility considering Six Flags will probably install a plethora of these. I would rather see these than boomerangs, so I would be down for Six Flags and Cedar Fair parks putting these in. I guess I'm starting a trend, being late for reports haha. Anyways, I went to the June 9th Passholder RailBlazer preview. The coaster was great. The ride overall is super compact and intense, and stays smooth all the way through indeed. My only knock would be the breakdowns (it did break down a bit) and the reason why it wouldn't be a Top 5 coaster for me is the restraints, which weren't very comfortable on my shoulders. That was kind of a knock, but as I said, it was overall a great ride. 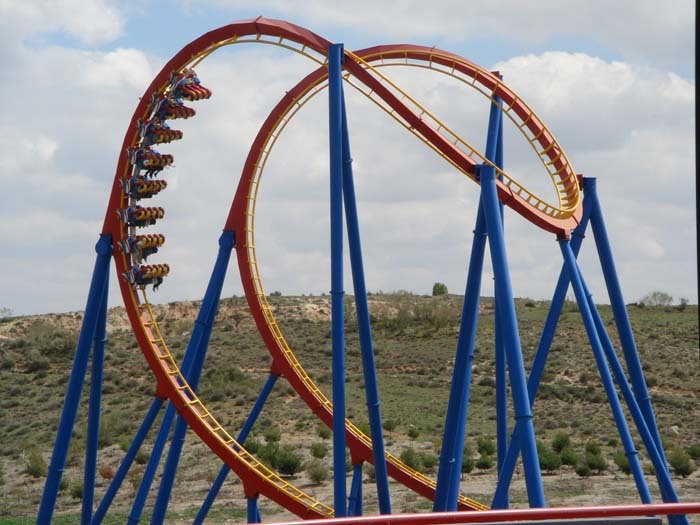 My mind is still trying to process what the f*ck I just rode last weekend at Fiesta Texas, so you guys are in for a treat. Also, between this and Flight deck the G force junkies will have a field day at CGA. So yesterday I rode Railblazer four times during passholder previews. I definitely think it was worth the wait. Despite the length of the lines it actually wasn't too bad. The ride itself was pretty smooth and had a lot of airtime and g forces. But the only thing that made this ride from being a solid 10/10 was the shoulder straps in the restraints. These things are really uncomfortable, especially if you're a tall person with broad shoulders. It's really hard to fully enjoy the ride when the g forces bash and strain your shoulders into the straps. Personally, this is a roller coaster I wouldn't mind riding again, but I don't think I'd ride it more than twice. I give it an 8.5/10. It's an awesome ride, but it's rough on the shoulders. WayCool64 wrote: So yesterday I rode Railblazer four times during passholder previews. I definitely think it was worth the wait. Despite the length of the lines it actually wasn't too bad. The ride itself was pretty smooth and had a lot of airtime and g forces. But the only thing that made this ride from being a solid 10/10 was the shoulder straps in the restraints. These things are really uncomfortable, especially if you're a tall person with broad shoulders. It's really hard to fully enjoy the ride when the g forces bash and strain your shoulders into the straps. Personally, this is a roller coaster I wouldn't mind riding again, but I don't think I'd ride it more than twice. I give it an 8.5/10. It's an awesome ride, but it's rough on the shoulders. The restraints are definitely kinda awkward. They're like a janky version of the Intamin OTSRs on Maverick, etc, except less comfy. I see why lap bars were out of the question for these rides (transitions and intensity), but the OTSRs could have been a lot comfier. On my first ride on WWGLC, the left strap actually came off of my shoulder on one of the airtime hills, which really does show how insane these things are. I didn't realize Wonder Woman and Rail Blazer were mirrored clones where WW drops off the lift to the right and RB drops to the left, so I guess technically not relly a "clone" maybe. Doesn't really matter but it's kinda cool. I went to the first day of Railblazer's public operation yesterday. I heard all about how crazy the ride is. However, I wasn't prepared for the level of "what the f%#k" that the ride delivers. I'm still having trouble processing how such a compact layout can deliver g-forces like that. The positives are really strong, and the airtime is among the strongest I've ever felt (the airtime hill reminded me of Skyrush). The queue was mostly full, but that didn't matter to me. I had a Fastlane (thanks to the unbelievable Presidents' Day sale), and walked right up to the station for each of my rides. Not only did the ride attendant fulfill row requests, I was usually asked what row I wanted. In the end, I got 10 rides: 8 in the front and 2 in the back. I also took one ride each on Flight Deck and Gold Striker, both awesome. I also got a ride on the sky ride. I don't usually go for these, but I felt that I should do it in honor of Bill. It was relaxing and delightful. I haven't ridden Patriot since the conversions, but I ended up skipping it in order to get more rides on Railblazer. I do not regret my decision. All in all, a lovely day at the park on what is easily the best roller coaster on the West Coast. Awesome review! Was the regular line packed for opening day? How were crowds overall since it was a Thurs?